Say hello to the eLuxurySupply platform bed! After constructing a prototype platform bed for a mattress photo shoot eLuxury received hundreds of emails from customers asking where they could buy the platform bed pictured. At the time only one existed, but eLuxurySupply decided to give the people what they want and built a quality, easily assembled, and aesthetically pleasing platform bed. In this week’s review, Sleepopolis decided to put eLuxury’s newest frame to the test. Will it meet the lofty expectations? Keep reading down below to find out! Featuring a sturdy, modern look, the eLuxurySupply platform bed could be a solid pick for those looking to shake up their bedroom decor. And you can get 30% off your purchase with code SleepopolisReview. Don’t have time to read the full review? Click here to hop on down to the review summary. 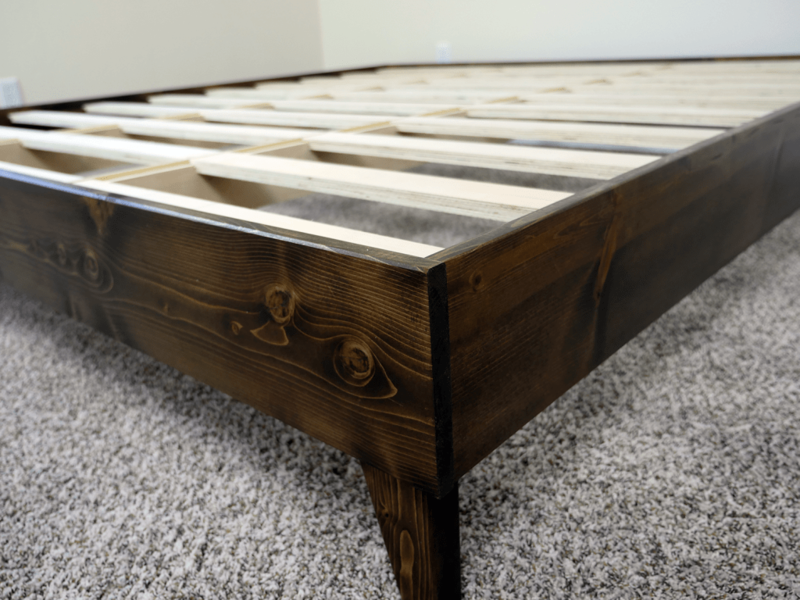 The eLuxurySupply platform bed is made up of a combination of North American Pine and other hardwoods. With a modern walnut finish, this platform has a sleek modern look and feel. The king size has a total of 30 wooden slats, 3 sections of 10 slats that sit between 2 center support beams. The slats sit 5.75″ apart from each other and are rated to hold weight up to 900 pounds. In addition to that, the legs of the platform are 6.6″ tall. This allows for some storage space under the mattress. This also means the mattress is not sitting too high off of the ground. So as a sleeper you are easily able to get in and out of bed. Assembling this platform was by far the easiest I’ve put together to date. The perimeter of the frame snaps together without any tools, in virtually no time at all. After snapping all 4 sides together, I inserted the middle wooden support beams. Immediately after this we placed a total of 30 support slats, horizontally, across the support beams. Each horizontal wooden support slat fit perfectly into place with the middle pieces! This platform bed took me about 2 minutes to unbox and 5 minutes to build. 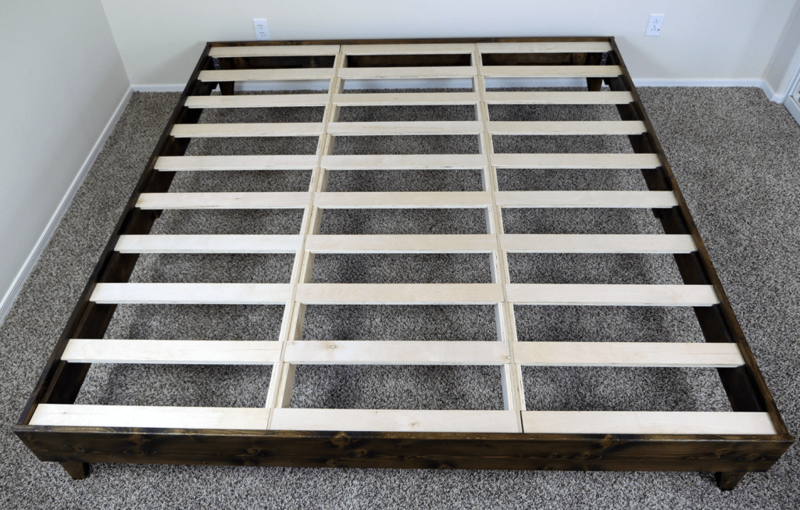 7 minutes to build a sturdy, stylish platform bed? I’ll take it. While putting the platform bed together I inspected for any defects or damage. I was unable to find a single issue with the eLuxury platform bed. The metal plates that hold the perimeter pieces into place were drilled perfectly and made it very easy for us to slide each edge into place. They have done a great job designing this bedroom accessory for easy assembly and a sharp aesthetic. Before receiving the eLuxurySupply platform bed I was slightly skeptical. I was thinking there is no way it wouldn’t creak at night or create the level of support I’ve been receiving from other much more expensive platform beds. However, I was pleasantly surprised. This platform bed supported my mattress extremely well. During my sleep tests I did not noticed any type of sag in the mattress, even while applying large amounts of pressure in different areas. Due to a large number of support slats, the platform bed is able to evenly distribute pressure across the mattress. As part of my durability tests (see more below) I stood directly on the frame, with all of my weight on single slat in the middle of that slat (the weakest point). While the slat bowed inward, it still held all of my weight without failing. This gives me plenty of confidence that eLuxurySupply has built a platform that will have no issues supporting my mattress for years to come. Thus far, I have not noticed any noises coming from the platform during normal sleep movements. I believe that having 30 individual boards is helping to this effect, as the individual boards are better able to distribute weight evenly without undue pressures building that might ordinary cause noise or sound. After assembling the eLuxurySupply platform bed I put it through a short series of tests. These tests were implemented to provide clarity on how sturdy the frame is from different angles, positions, and weights. Shake Test – after forcefully tugging and shaking at all 4 corners of the eLuxurySupply platform bed, it seems to be very well made. The support slats were tightly in place and remained in place throughout this test. Sitting Drop Test – throughout this test I dropped all of my weight (in a sitting / upright position) onto the mattress and foundation at 5 critical points. At each position, the platform bed supported my weight without any issues. Standing Drop Test – during this test I dropped my weight more aggressively. I placed all of my weight (standing) at 6 points on the mattress / platform to determine whether the platform bed would bend or incur any damage. Although I applied much more pressure to these points on the mattress / platform, it did not show any signs of weakness or damage. Flop Test – finally, the flop test. This test gives us an idea of how the platform bed holds up when flopping (back first) onto the mattress / platform from several different angles. To my surprise, the foundation handled my momentum quite easily. With very minor noise made, the platform bed did an excellent job of supporting the mattress in addition to my sudden weight drops. All in all, the eLuxurySupply platform bed did extremely well on all of my durability tests. Even though I applied significant pressures and weights the platform bed never showed any signs of structural weakness. I think it would take a substantial amount of pressure to damage this foundation. If you decide to give the eLuxury platform bed a try make sure to use this link. You can save 20% off your entire order instantly. Lightweight structure – after completely assembling the platform bed, it is still very easy to move around. If it does feel too heavy, you are able to easily remove slats for a lighter move. Who Should Buy the eLuxurySupply Platform Bed? Want a sturdy platform bed – eLuxurySupply’s platform bed is very impressive. Although the assembly takes no time at all, it is not reflected in the overall performance. 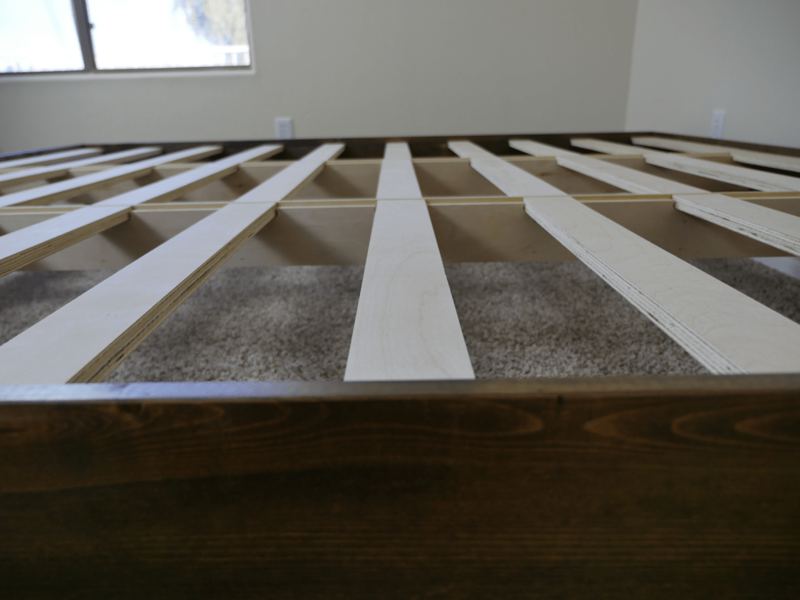 This platform holds the mattress in place extremely well and does not create any annoying noises a typical box spring or bed frame might create. Want a modern look – made from North American Pine, other hardwoods, and a modern walnut finish, this platform bed has a sleek aesthetic. The clean wooden look makes it easier to match to other bedroom furniture pieces. 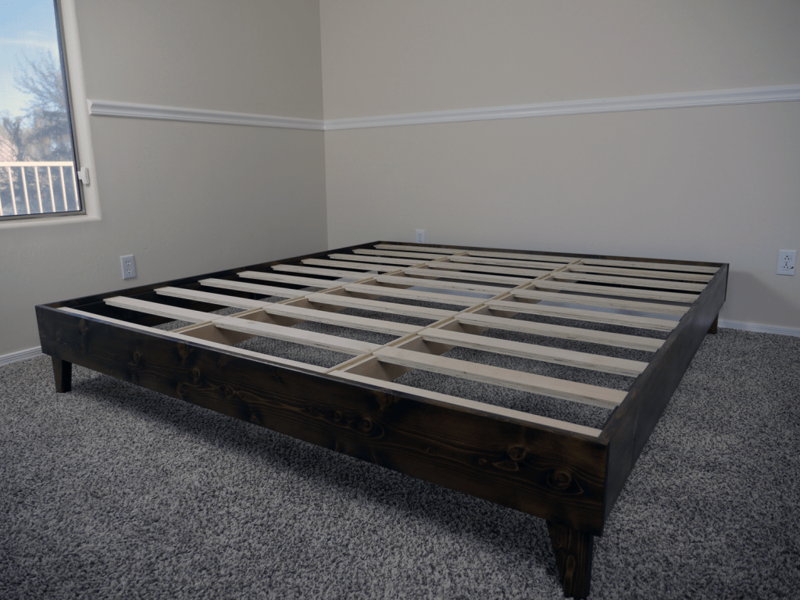 Want to get rid of their box spring / bed frame combo – the eLuxurySupply platform bed is able to support the mattress by itself, removing any need for a box spring or bed frame. Instead, you can have one piece of furniture supporting your mattress much better than the bed frame / box spring combo could have. Want hassle free assembly – this foundation took me just over 6 minutes to assemble. This includes removing all pieces from the boxes. If you’re tired of using tools and hoping you put the platform together correctly, this is a great option. No tools are needed and the whole set up is very lightweight. 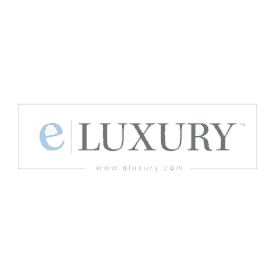 Wanting a little more information on the eLuxurySupply platform bed? Visit eLuxurySupply.com. The eLuxurySupply platform bed is one of a kind. Made from a combination of North American pine and other hardwoods along with a natural walnut finish, it is both structurally sound and extremely easy to assemble. No tools are needed, as this platform beds pieces all simply slide into place. If you’re in the market for a new platform bed / foundation, this is a great option. It’s hard to beat the sleek aesthetic, durable build, and overall support the eLuxurySupply platform bed provides.